Much like their human companions, dogs and cats can also suffer from gastrointestinal issues and digestive disorders. Wanting quick relief, it’s easy for us to hit the medicine cabinet for a remedy for ourselves, however, our pets depend on us to take action when we notice indications that their tummies are in distress. Read on to explore the signs and causes of chronic and acute gastrointestinal issues and to discover remedies recommended by your veterinarian that can help your pet feel better. Digestive disorders typically present themselves through vomiting, diarrhea, constipation, low appetite, excessive gas with strong odor and abdominal bloating. These are not uncommon acute conditions in dogs and cats, and they will generally resolve themselves rather quickly. However, if these conditions worsen or occur over several consecutive days, you should call our Oakland Park vet for a check-up to rule out serious illnesses or chronic digestive issues. While many issues will pass naturally, certain digestive issues can be very serious and result in the death of your pet if left untreated. For good measure, it’s best to bring your pet to the veterinarian so we can diagnose the underlying cause and take appropriate measures to ensure your pet’s quick recovery and restore their health. These are some conditions you should be aware of. Worms and parasites often transmitted through pet feces can source digestive issues. Dietary indiscretions like eating garbage or table scraps can result in food poisoning and stomach upset. Pancreatitis occurs when the organ has difficulty processing consumed foods or medications. Serious viruses like coronavirus or parvovirus cause vomiting and loose, bloody stool and should be treated right away. Bacteria such as Salmonella, Campylobacter, Clostridia and E. coli can be transmitted from animals to humans and must be treated immediately to prevent death or being passed on. Inflammatory bowel disease is a chronic condition with unknown causes. While incurable, it is manageable with proper veterinarian care. Hemorrhagic gastritis is caused by bacteria, fungi, parasites and certain viruses. This condition mimics the symptoms of parvovirus which are bloody stool and profuse vomiting. 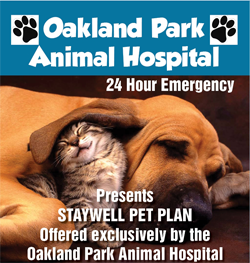 Here at Oakland Park Animal Hospital, we’re prepared to help identify the causes of your pet’s condition and offer immediate treatment options. Ample amounts of clean water and a specialized food is the most common recommended treatment for pets experiencing digestive problems. Formulas are available specifically for GI issues from your vet and most pet stores. Long term relievers such as oral steroids can be administered under the care of your veterinarian for chronic conditions such as IBD. 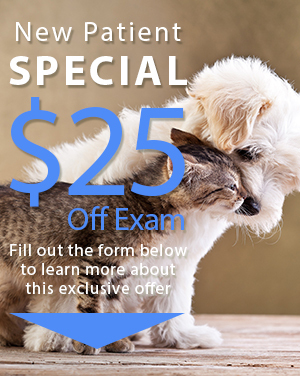 If you suspect that your pet has a gastrointestinal issue, call us here at Oakland Park Animal Hospital at (954) 731-4228 to make an appointment today. We’ve been proudly serving Oakland Park for 24 years along with the surrounding communities of Fort Lauderdale, Lauderdale Lakes, Lauderhill, Wilton Manors, Plantation.